Sooner than expected, Japan is headed to the polls: prime minister Yoshihiko Noda (pictured above) announced today that he will dissolve Japan’s lower house of parliament, the Diet, on Friday, clearing the way for snap elections on December 16. It seems very likely that the Liberal Democratic Party of Japan (LDP, or 自由民主党, Jiyū-Minshutō), which controlled the Diet from 1955 to 2009, will return to power, and former Japanese prime minister Shinzō Abe (安倍 晋三), who served exactly one year as prime minister from 2006 to 2007, seems likely to return for a rare second stint leading Japan’s government following his selection as the LDP’s leader in late September. Noda said the dissolution will be contingent on the LDP’s support for a package of measures to issue deficit-covering bonds this week, but the LDP seemed likely to support that package in any event. The election will affect at least a half-dozen key policy issues, including relations with China, Japan’s pacifist constitution, a controversial sales tax increase set to go into effect in 2014, the Trans-Pacific Partnership agreement with other Asian countries and the United States, the future role of nuclear energy and fiscal policy in a country that’s seen low GDP growth since the 1980s. Noda’s announcement was so striking because he needed to call an election only before August 2013, but currently, a record-high 64% of Japanese voters disapprove of his government, with just 18% approving. Since the Democratic Party of Japan (DPJ, or 民主党, Minshutō) took control of Japan’s parliament after the 2009 elections, things haven’t gone so well for them — the party has gone through three different prime ministers in three years. 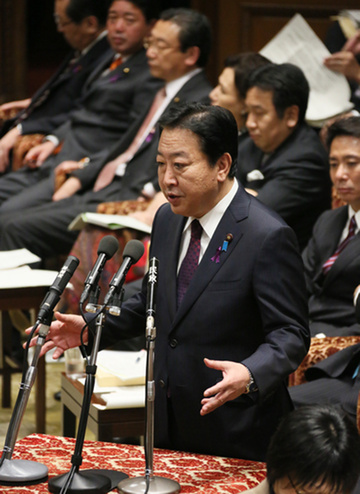 The DPJ’s first prime minister, Yukio Hatoyama (鳩山 由紀夫), had only nine months in office. Initially popular after riding the wave of high expectations following the DPJ’s massive electoral victory, Japan’s long-suffering economy and failure to live up to those expectations led to a quick downfall in his support. Furthermore, Hatoyama backed away from a campaign promise to close the U.S. Marine Corps base in Okinawa, but ultimately caved to pressure from Washington, despite the U.S. base’s wide unpopularity in Japan. He also suffered from the interference of Ichirō Ozawa (小沢 一郎), a longtime LDP fixer who switched parties to support the DPJ in 2006, and Hatoyama never escaped the impression that Ozawa was calling the shots for Japan’s government. It didn’t help that Ozawa was implicated in a funding corruption scandal; when Hatoyama resigned in 2010, Ozawa resigned as secretary-general of the DPJ as well. Hatoyama’s finance minister and deputy prime minister, Naoto Kan (菅 直人) succeeded him in June 2010 and survived a bit longer — until September 2011. Kan initially found himself challenged by Ozawa, first over a proposed increase of Japan’s sales tax rate from 5% to 10% and in September 2010, in a direct leadership challenge. Although Kan defeated Ozawa narrowly on a 206 to 200 vote, the leadership fight brought into the open the wide divisions within the DPJ, especially following losses in the July 2010 elections for the House of Councillors, Japan’s upper chamber of parliament. Kan faced his biggest challenge in the March 12, 2011 earthquake and tsunami, which led to the Fukushima nuclear power plant failure shortly thereafter. Kan adopted a policy of reducing Japanese dependence on nuclear power, but the nuclear crisis quickly eroded what remained of Kan’s popularity, and he was able to push through a renewable energy bill shortly before leaving office. Since the vote, Japan’s become engaged in increasingly testy diplomatic tangles with South Korea over the Takeshima islands (Dokdo in Korean) and with China over the Senkaku Islands (Diaoyu in Chinese). China, this week, is observing the once-a-decade transition of its leadership, and South Korea will hold its own presidential election in December. Noda’s decision to dissolve the Diet caused further tumult within his own party and, amid calls on Noda to resign as leader, it remains unclear exactly who might lead the DPJ in next month’s election. In the meanwhile, the more nationalist Abe and the LDP stand poised to return to office, especially given that the DPJ showed that it’s just as divided internally as the LDP was when it was in power, and that the DPJ hasn’t been able to pull Japan’s economy or political system out of a decades-long malaise. Given the unpopular sales tax rise and lingering doubts about how the DPJ governments have handled the Fukushima nuclear crisis, it’s not a surprise that The Economist‘s Asian blog Banyan has already (with The Economist‘s standard level of tact) dubbed it Japan’s kamikaze election. Abe, who is known as a relative hawk, even within the LDP, has expressed an interest in revising the Japanese constitution’s famous pacifist Article 9, under which Japan is prohibited from any act of war, thereby clearing the way for Japan to build a military force in the future. In winning the LDP leadership in September, Abe defeated Shigeru Ishiba, who is more popular among Japanese voters, by mobilizing more support from the legislative factions among the LDP’s Diet members. Ozawa, for his part, stomped out of the DPJ in July over the sales tax increase, taking 37 MPs with him and forming a new third party, People’s Life First (国民の生活が第一, Kokumin no Seikatsu ga Daiichi). His populist message in the election will be one of repealing the sales tax increase and eliminating the use of nuclear energy altogether. Although weakened, Ozawa will surely be a factor in December’s election. Without Ozawa’s 37 MPs, the DPJ holds just a bare majority of 243 seats in the 480-member Diet, while the LDP holds 117 seats. The DPJ will also contend with two new movements from two popular mayors in Japan. Osaka Mayor Tōru Hashimoto (橋下徹) in September 2012 formed the Osaka-based, economically liberal Japan Restoration Party (日本維新の会, Nippon Ishin no Kai). Hashimoto, who has been mayor since 2011 and governor of Osaka prefecture before that, is one of Japan’s youngest rising politicians, and his party champions the Trans-Pacific Partnership, opposes the resumption of local nuclear reactors and calls, generally, for more local fiscal control, including over the recently enacted sales tax increase. Meanwhile, former Tokyo mayor Shintaro Ishihara (石原慎太郎) has formed his own new party, the stridently right-wing Sunrise Party (太陽の党, Taiyō no Tō) earlier this month as yet another third-party alternative to the LDP and DPJ. Ishihara’s hopes to form an alliance with Japan Restoration and other third forces, however, have stalled. Neither Hashimoto nor Ishihara are willing to form a coalition with Ozawa’s People’s Life First party, however. After a career in the arts and as an author, Ishihara spent 25 years in the Diet as an LDP member until 1995 — Ishihara had been tied financially to Aum Shinrikyo, the Japanese cult that carried out a sarin gas attack on the Tokyo subway, and he promptly resigned after the horrific attack. He returned to politics as an independent, winning the Tokyo mayoral race in 1999, stepping down just last month to reemerge in national politics. The Buddhist, conservative New Kōmeitō (公明党, Shin Kōmeitō), led by Natsuo Yamaguchi, has been a perennial small party in Japan for years, and holds the fourth-largest number of seats with 21 MPs. It has allied itself in coalitions with the LDP in the past. Japan has a dual-voting system — 300 members of the lower house are elected in single-seat constituencies (on a straightforward first-past-the-post plurality vote) and 180 members by proportional representation (in 11 districts). Voters will elect one candidate in their local constituency and will vote for another party (each party will have a list of candidates for each of the 11 electoral blocks).